EXCITER, RIOT V, THE RODS and LIEGE LORD are the leading four legendary old school metal bands confirmed for the Defenders Of The Old III festival, to be held March 13th - 14th, at The Bell House in Brooklyn, New York. 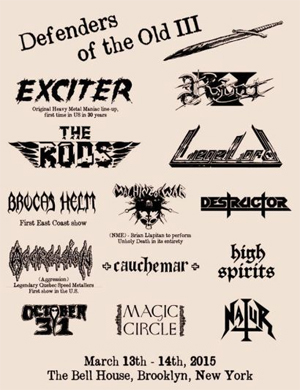 The complete band lineup for the festival includes: EXCITER, RIOT V, THE RODS, LIEGE LORD, BROCAS HELM, MACHINE OF WAR, DESTRUCTOR, AGGRESSION, CAUCHEMAR, HIGH SPIRITS, OCTOBER 31, MAGIC CIRCLE, NATUR. Friday, March 13th schedule: Riot V, Liege Lord, Destructor, Machine Of War, Aggression, Magic Circle. Saturday, March 14th schedule: Exciter, The Rods, Brocas Helm, High Spirits, October 31, Cauchemar, Natur. For the latest festival news, ticket and lodging information, go HERE.